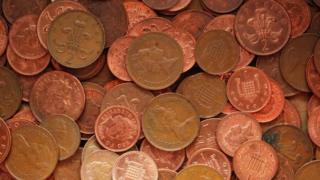 One of the most vociferous arguments made against scrapping 1p and 2p coins in the UK is that shops would automatically round up prices.But analysis by Bank of England economists says the fear of everything becoming more expensive would be unfounded if coppers were ditched. It says card payments make the issue irrelevant, and far fewer items are now priced ending in 99p.The government recently ruled out scrapping coppers amid a backlash.In the chancellor's Spring Statement, a Treasury consultation about the mix of coins in circulation appeared to pave the way for the end of 1p and 2p coins. A swift reverse by the Prime Minister's official spokesman declared there were no plans to scrap the copper coins: "One of the elements was whether the denominational mix of coins meets the public need. From the early reaction it looks as if it does." That Treasury consultation explained that surveys suggested six in 10 of UK 1p and 2p coins were only used once before being put in a jar or discarded, while one in 12 was thrown into a bin.The value of the 1p coin has also been reduced by inflation so, in effect, the 1p coin is now worth less than the halfpenny when it was abolished in 1984.Among many of those who support the continuing use of copper coins, the belief is that retailers would simply round up prices to the nearest 5p if copper coins were scrapped.Writing on the Bank of England's blog, Bank Underground, Marilena Angeli and Jack Meaning argue that - even if this happened - it would have little or no effect on the cost of living, as measured by inflation. Many countries - including Canada, the home of Bank of England governor Mark Carney - have ditched their low denomination coins. Australia, Brazil, and Sweden are among many others to do so.Various studies from around the world showed that removing low denomination coins would have little or no impact on prices, Ms Angeli and Mr Meaning wrote. "As inflation steadily erodes the purchasing power of low denomination coinage, the case for its removal becomes stronger," the Bank of England economists conclude. "This is not a new phenomenon and has been seen time and again, the world over. Even in the UK there is a precedent with the abolition of the halfpenny in 1984. "Many of the arguments that were made in the early 1980s around the inflationary impact of removing that particular tiny coin are being made now. However, the evidence, including our own work on UK price data suggests they are unfounded. "The conclusion does not form part of Bank of England policy, but is published on the Bank's blog aimed at "sharing views that challenge - or support - prevailing policy orthodoxies".